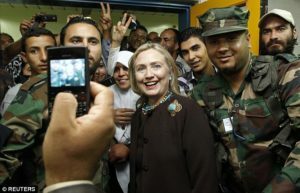 As a supporter of Muslim Brotherhood, Hillary Clinton was well aware that her push to remove Col. Moammar Gadhafi from power in Libya would lead to the rise of Islamists in the country, emails released by WikiLeaks show. Clinton also acknowledged that the Muslim Brotherhood wielded the “real power” in the rebel movement in Libya that she was supporting — and that their Brotherhood allies in Egypt were waiting in the wings to move into Libya’s oil sector. In a March 27, 2011 memo, Sidney Blumenthal explained that “radical/terrorist” groups were “infiltrating the NLC,” or National Libyan Council, a rebel quasi-government that earned French recognition as Libya’s governing body that same month. Clinton was warned that Al Qaida could become major players in the region. “This situation has become increasingly frustrating for French President Nicolas Sarkozy, who, according to knowledgeable individuals, is pressing to have France emerge from this crisis as the principal foreign ally of any new government that takes power,” Bluemthal’s memo states. On May 30, 2011, Hillary aide Jake Sullivan sent the secretary of state a full list of known “Libya emissaries.” By then, the National Libyan Council had given way to the Transitional National Council (TNC), but the “real power” still lay with the Muslim Brotherhood. Clinton forwarded that email to an aide, acknowledging that she had received it and assessed its contents. Sidney Blumenthal wrote to Clinton again on July 3, 2012, two months before the Benghazi attacks, to talk about the upcoming election. The election, Blumenthal noted, was how the Muslim Brotherhood in Egypt was hoping to use the new Brotherhood party in Libya to get into the Libyan oil game. “Source Comment: In the opinion of a knowledgeable individual, the division of the 200 seats in the GNC lies at the heart of this matter, with 120 seats allotted for the Tripolitania, 60 for Barqa, and 18 for the Fezzan area,” Blumenthal wrote. Meanwhile, Clinton was helping to spur the uprising that led to the Muslim Brotherhood briefly taking power in Egypt around the same time. And a young Clinton Foundation employee, Gehad El-Haddad, was already working in Cairo to help the Muslim Brotherhood gain power. El-Haddad was arrested in 2013, following the brief reign of Mohammed Morsi, for inciting violence. He was reportedly one of Morsi’s top advisers. El-Haddad was sentenced to life in prison in 2015.